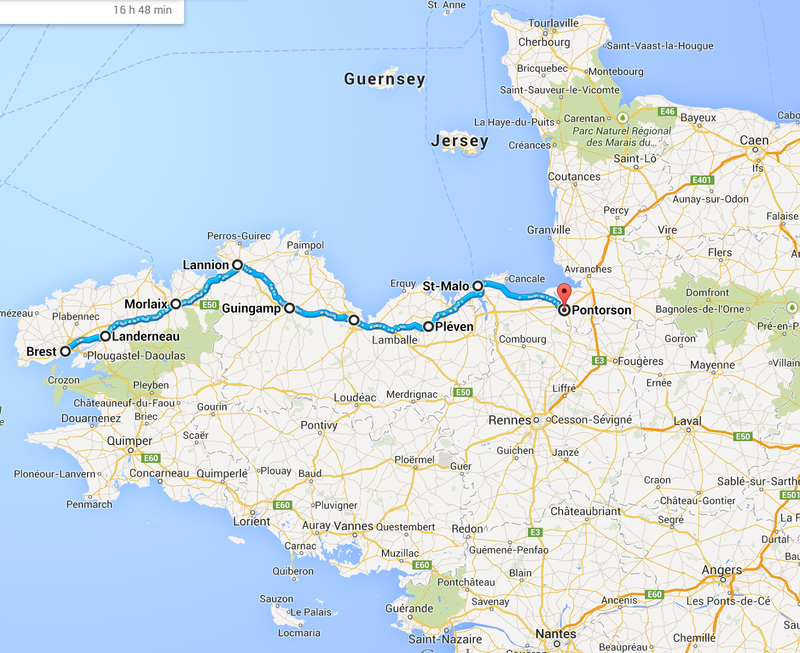 More planning for the Brittany Rain Tour 2014. I took a look at some of the hotels in the region, and, at least according to Booking.com, I'm not the only one taking a vacation in Bretagne next week. I guess since Thursday next week is a bank holiday, many people will be taking a mini-vacation for the long weekend. Some of the cities looked almost completely sold out. Having already experienced arriving in a city where all hotels were sold out (Dieppe, during my Paris-London trip in 2012), I decided to do things a bit differently this time: tonight I reserved hotels for most of the days of my trip. I usually prefer to wait and reserve each hotel day by day, as this gives me flexibility to change plans, or, if I end up with aches and pains, the possibility to stay in bed for an entire day before continuing my journey. However, the past trips I've taken were during the off-season. Preferring to not have to sleep on the street, without a tent, in the rain, I opted to reserve rooms ahead of time, this time. The good news is that all reservations have free cancelation. Each leg is about 40km, which is less than the average of 65km per day I've done on previous trips, so hopefully I won't need that whole day in bed this time! Yeah, you'll be glad to have those rooms waiting for you, Carmen. The alternative is too awful to contemplate. Out in the country out of reach of towns or campgrounds, I've pulled off the road and camped in a field or two in my time and it's usually fine, but it's nowhere near as nice as having a bed and a shower and a hot meal in a restaurant.